2002 sees the debut of our single vineyard 'Isobel' bottling from the world-class Charles Heintz Vineyard, high on the Occidental Ridge, a mere 6 miles from the Pacific Ocean. Since 1998, consistently one of our favorite Chardonnay sources, this vineyard offers a singular expression of Californian Chardonnay that truly warrants an individual designation. 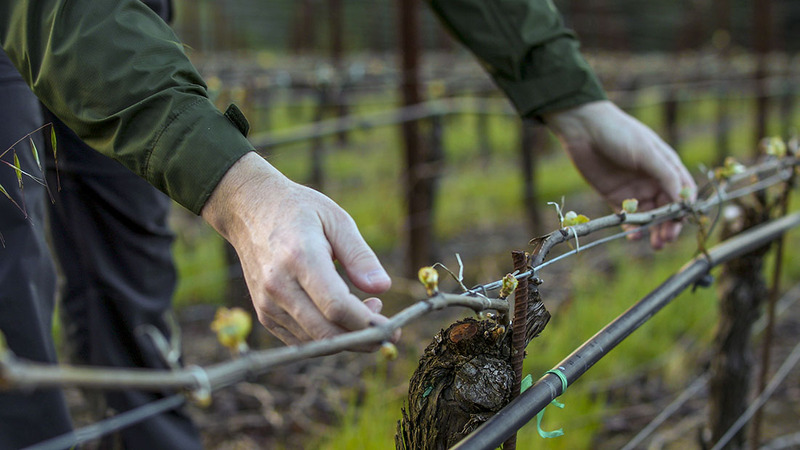 There are many complex inter-related environmental factors that make the Charles Heintz Vineyard such a special place, so much so that it has a certain aura that is both compelling and fascinating. The high elevation gives tremendous intensity of sunlight moderated by the cool coastal climate. This combines with 20 year old mature vines, intensive farming practices, harvesting at pin-point flavor maturity for our stylistic goal and non-intrusive winemaking to make this an exotic yet cerebral chardonnay experience that appeals to both the palate & mind in equal measure. We boldly refer to this as the 'Corton of California' with its richness yet austerity. The Sonoma Coast, Russian River and Green Valley appellations intersect at this vineyard, thus its climate is wholly coastal driven with cool foggy mornings, mildly warm days and cold nights. This allows a tremendously long growing season and protection from heat spikes, which can send sugars racing. The mature non-irrigated vines with their extensive root systems steadily ripen the moderate crop and most importantly retain high levels of thirst-quenching natural acidity. This adds balance to the richness of the fruit, picking up the palate and extending the remarkably long lingering finish. Native yeast fermentation preceded a long steady malolactic of 10 months prior to bottling without filtration. We opt not to lees stir this bottling so as to amplify the natural site-driven flavors, texture and structure. A pale straw color with hints of gold precedes a nose that is initially reticent with subtle aromas of flint, hazelnut and lemon zest that blossoms with aeration to present riper tropical fruits and toasted fresh bread. The palate is similarly initially taut and backward with subtle grapefruit, minerals and an attractive stony leanness. Swirling brings forth a cascade of ripe stone and tropical fruits, complemented by a creamy mouthfilling texture and a prominent steely acid structure that provides great persistence and satisfaction. This is an age-worthy Californian Chardonnay that will benefit from 5 years in a cool cellar allowing the richness of the wine to blossom as it sheds its youthful austerity.